My wife and I just went down to Playa Del Carmen in Mexico for our second honeymoon and it was just great. No emails. No phone calls. No baby. It was amazingly rejuvenating. Before I left though, I thought I would bring a couple packs of 2011 SP Game-Used Soccer I had at my desk figuring some of the staff at the resort would get a kick out of the cards with soccer, I mean fútbol, being so popular down there. I had my wife stock them away in her purse and I almost forgot about them until we had an exceptionally great server one night and we began chatting about fútbol in my horrifically bad Spanglish. As a thank you for his great service, on top of a tip, I gave him one of the packs. 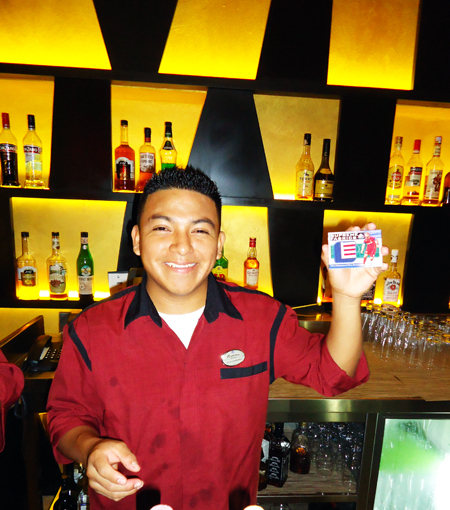 He looked at it a bit confused for a minute and I shared, “Esos son tarjetas de fútbol.” A big smile came to his face and he opened the pack. He poured through the cards and thanked me repeatedly. He took them back and showed some of the other servers who looked at them in jealousy. They actually almost started fighting over them. I had no idea these would be such a tremendous hit with them. 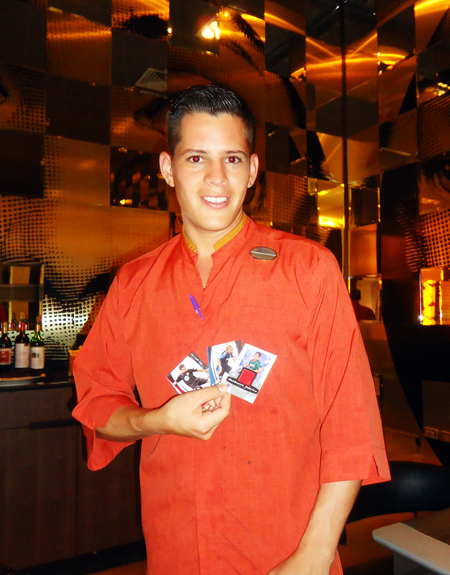 Most staff at resorts in Mexico LOVE soccer and sharing fútbol cards with them was a big hit! The next day I met a staffer who was excited to hear I work for Upper Deck because he shared he has Brett Favre’s Upper Deck rookie card. I asked him if he liked fútbol and he began talking so fast I couldn’t understand a word he said. I shared a pack with him as well and he was just in heaven showing them to other staff and talking about how excited he was to share them with his kids. He actually pulled a great card as well so it was fun to see his excitement as he quickly became the envy of all the other servers. All smiles!!! Most Mexicans are very passionate about soccer and loved the opportunity to score Upper Deck soccer cards. Chris, what a great idea! I love to give cards out to people who are not collectors and watch them light up or become a collector. Seems that one has to start somewhere as I of course as a kid hit the local candy/confectionary shops. So many people I have given cards to are now collectors..Great story! !